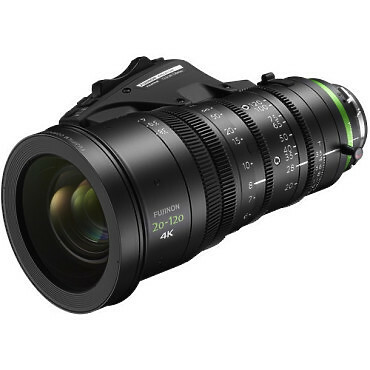 The Fujinon 20-120mm Cabrio XK6x20 lens is a wide-to-telephoto zoom lens for Super 35mm cameras in PL mount. The focus, zoom, and iris barrels are geared with standard 0.8 film pitch, which provides an interface for the removable ENG-style digital drive unit. 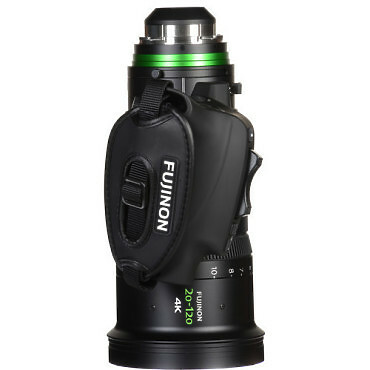 The detachable drive unit is an ENG-style handgrip with a zoom rocker switch, 16-bit encoding, and an interface for remote control via a wired or wireless controller from Fujinon or other compatible, third-party manufacturers. When the drive unit is attached to the lens, a digital auto-aligning system quickly and accurately calibrates it to the zoom, focus, and iris gears. Power is provided by either an external connector or the PL mount's interface. A removable lens support is included with the lens. The rear PL mount features electrical contacts for sharing Arri LDS and Cooke /i Technology lens data with the camera.